Results: At a former uranium mill-tailing site in Rifle, Colorado, scientists are studying how microbes interact with minerals and metals to better understand processes that can help remediate the site. Electron microscopy, or EM, provides the resolution needed to study microbial transformation of metals, but there's a catch. Typically, sample preparation for EM results in samples that are dehydrated, and dehydrating a microbial sample can shrink and distort its shape, or morphology. So scientists at Pacific Northwest National Laboratory and Lawrence Berkeley National Laboratory turned to state-of-the-art EM approaches at the Department of Energy's EMSL to get a "wetter," thus better, understanding of the morphology of metal biotransforming bacteria and their interactions with minerals. Why it matters: The insights provided by this study are relevant to developing strategies for environmental remediation; in particular, to assess the impact of microbes on intermediate, or pore-scale, transport and biogeochemical processes. Studying these processes requires an understanding of hydrated microbial morphology, such as that of extracellular polymeric substances (EPS). EPS are a hydrated network of lipids, polysaccharides, and protein complexes commonly found associated with metals and radionuclides. They are also important in biofilm formation, and thus have implications for processes ranging from corrosion to diseases such as cystic fibrosis. EPS are typically among the most difficult biological structures to study in their native state, posing a major challenge for obtaining accurate EM images. Methods: Using cultures of metal-reducing microorganisms and samples obtained from the U.S. Department of Energy's uranium-contaminated Integrated Field Research Challenge site in Rifle, Colorado, the scientists compared traditional sample preparation methods and techniques at EMSL, which is located at PNNL. Some of the imaging resources offered there range from high-resolution transmission electron microscopy and scanning electron microscopy to a suite of microscopy tools with cryogenic—or freezing—capabilities. EMSL is one of the few places in the U.S., and the only user facility, where such capabilities are currently available. 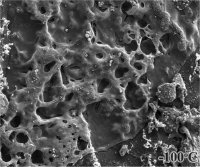 Their comparison showed that for lab-grown microbial cultures and natural biofilms, cryogenic EM methods yielded largely artifact-free images, with cells and extracellular matrix preserved in their close-to-natural hydrated state, whereas traditional methods caused substantial shrinkage of the highly hydrated—about 95 percent H2O—extracellular matrix. The ability to prepare and examine samples in the close-to-natural state is available to users through the EMSL user proposal process. Acknowledgments: This work was funded by the Department of Energy Subsurface Biogeochemical Research program as part of DOE's Office of Biological and Environmental Research Scientific Focus Area Program, and the EMSL Intramural Research and Capability Development Program. Portions of the work were performed at EMSL, a national scientific user facility located at PNNL. The research team includes Alice Dohnalkova, Matt Marshall, Bruce Arey, and Jim Fredrickson, PNNL; and Ken Williams and Edgar Buck, LLNL. Reference: Dohnalkova AC, MJ Marshall, BW Arey, KH Williams, EC Buck, and JK Fredrickson. 2011. "Imaging hydrated microbial extracellular polymers: comparative analysis by electron microscopy." Applied Environmental Microbiology 77(4):1254-1262. DOI: 10.1128/AEM.02001-10.